What Else Will You Learn On My Next Residential Badminton Coaching Weekend – 20/21 November 2010? One of the key skills in coaching for both the player and coach is to reflect on what has happened and ask what worked, what can be done better, how can we do this better, when is the best time to do it? Since my last residential coaching weekend, I set myself a lot of reflection time because a weekend residential course is a big commitment for a player and coach. Apart from the cost, it’s a huge time commitment in terms of travel and spending the whole weekend away from home. On the other hand, for some, it’s a once in a lifetime opportunity to immerse yourself in a sport you love and return home a significantly better player. So, the difficulty at times is deciding what to leave out and what to do more of. The most important change will take place on Saturday afternoon. Immediately after lunch, we are going to tackle your biggest badminton challenges head on! Yes, that’s right. Rather than wait for the appropriate slot in the weekend, you’ll be able to spend more time solving the big problem, the one that’s given you a real headache for as long as you can remember. And, we won’t stop until you get it! Generally, an hour doing only one thing can remove the barrier that has stopped you achieving for so long. This could be finally solving your weak backhand that continues to give away point after point in your games and matches. It could be your defence that’s letting you down or that you’re never satisfied with the power of your smash. And, when we’ve finished that exercise there’s going to be an all-out attack versus defence blitz! Yes, no matter how well you attack or defend we’ll be looking to give them a fuel injection system and take them to a whole new level. By now you may be part way through the season. If results have been going well for you, you may be thinking about having some coaching but as you’re playing well and winning you’ll leave the coaching until another time. But, what happens when the season gets that bit busier and you’re playing more often, not getting sufficient recovery time and you begin to tire? Or, you suddenly have a dip in form, change partners or have a knock back due to injury? Who’s going to pick up the pieces then and get you back on your feet? What if you’ve had a bad start and are already losing confidence as well as games? What if everything seems to be going wrong and you don’t know how to fix it? If either of these scenarios sound familiar, or you just want to get better and haven’t the opportunity to do so locally, then get in touch and book your place on my next residential coaching weekend. “I learned so much on this course. Paul’s eye for detail and ability to point out small alterations to my movement and shot making has made a real difference to my competitive badminton playing. The weekend was full on, covered a wide range of shots with clear explanations and demonstrations and both coaches were incredibly approachable, enthusiastic and always willing to work one on one. This course has made a significant difference in my play and knowledge. Unlike other courses, we spend virtually all of the time learning and practicing. Games are generally played at break intervals. Also, there’s lots of time to spend with the coaches as we’re always back in the sports hall way before the session begins. This can be used for general questions, or to get on court and work on another challenge you’ve got. I’ve heard of so many courses using poor shuttles. A poor shuttle is a massive distraction on any coaching session. Not only do you feel cheated if you’re having to use poor shuttles, but you also spend more time changing the shuttle and re-testing. This is not fun and is extremely off-putting. Whenever I’m coaching I use good shuttles. That’s why on my residential course I use Yonex Aerosensa 40 shuttles. Yes, they’re a bit more expensive than many other brands, but the consistent quality and performance make this an easy winner for me. Many players said how pleased they were when we opened the box of shuttles and brought out a tube of Yonex Aerosensa 40’s. The number of positive comments alone confirms my stance about using these fantastic shuttles. We’re also fortunate to have a huge range of Yonex demo racquets. So you can delve into the bag anytime you like and select from the wide range. You never know, you may find a racquet that really suits your game. And, there’s no pressure to buy as we will only have demo racquets at the event, not new ones. Come on, what are you waiting for? Click on the link and begin the first stage of taking your badminton to a new level. You’re guaranteed to leave a better player and you never know, you may be the lucky winner of our super prizes too! All you have to do is click below to visit my dedicated residential weekend page where you will find the price and a link to the simple online application form. 2017-08-22T23:05:15+01:00By Paul Stewart|Categories: Badminton Coaching Weekends|Tags: Badminton Basic Skills, Badminton Coaching, Badminton Smash, Badminton Strategies & Tactics, Badminton Training|Comments Off on What Else Will You Learn On My Next Residential Badminton Coaching Weekend – 20/21 November 2010? 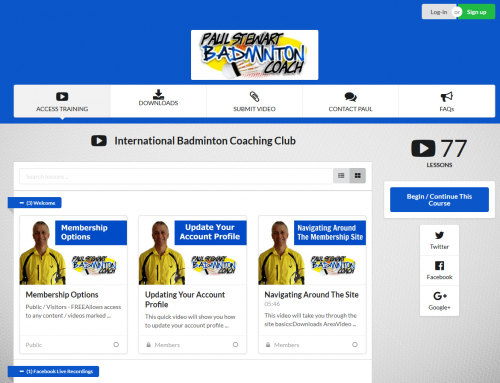 Discover a unique way of receiving badminton coaching, with information and playing analysis available to you wherever you are in the world. What Will We Be Coaching at Lilleshall This Weekend 18/19 February 2012 and What Can You Learn From This?